For the last five years, Iran has been at odds with the United States and other Western powers over its nuclear program. So far, Western attempts to get Iran to scale down or halt its enrichment of uranium have been largely unsuccessful. And now Iran is threatening to enrich uranium to 60 percent purity if further negotiations over its right to enrich fail. Why is there such turmoil over enriching uranium, how is it done in the first place, and why does the enrichment percentage matter so much? Not all uranium atoms are alike. When unearthed, raw uranium consists of two different isotopes, each with a different number of neutrons. Both types, uranium 238 and uranium 235, are named for their respective atomic weights. The vast majority of naturally-occurring raw uranium, around 99.3 percent, is uranium 238. The rest is mostly uranium 235. Though chemically identical (they create the same molecules), the two kinds of uranium differ in one very important aspect: Uranium 235 is far less stable. A single additional proton will cause the atom to burst into fission, splitting into two smaller atoms in an explosion of energy and additional protons. Gather enough uranium 235 together, and this will rapidly cause an exponential chain reaction. This reaction, when controlled at a steady rate, is what nuclear power plants use to create energy. But when left uncontrolled in a nuclear weapon, this same reaction creates a vast amount of energy – and potential destruction. For such a chain reaction to take place, raw uranium needs to be processed to raise its percentage of uranium 235. This is called uranium enrichment; the greater the percentage of uranium 235, the more it is enriched. Because uranium needs to be separated atom by atom, the first step of any enrichment process is to transform the raw, solid uranium into a simple gas, uranium hexafluoride. This way, the enrichment process can deal with individual gas molecules, each containing a single uranium atom. Though uranium can then be enriched through various methods, the technique the Iranians use involves many spinning centrifuges linked together to exploit the slight difference in weight between the two isotopes of uranium. As the centrifuge spins several hundred times per second, the heavier uranium 238 molecules are pancaked against the sides of cylinder, forcing the lighter uranium 235 molecules to cluster toward the center. This enriched center can then be siphoned off into another centrifuge, to have the whole process repeated again. Meanwhile, the un-enriched stream of uranium, which is not yet completely depleted of uranium 235, is recycled to a previous stage of enrichment. Though a single centrifuge will only slightly enrich a tiny quantity of uranium, in the Iranian facilities, thousands of centrifuges are running simultaneously. Most of the centrifuges are linked together in groups of 164, referred to as a ‘cascade.’ “This allows more work to be done on a smaller amount of material,” says Christina Walrond, an analyst at the Institute for Science and International Security. “[In a cascade] the centrifuges are used more efficiently, and less material is wasted,” she adds. Although the Iranians have about 9,000 centrifuges working in various cascades, the process of enriching uranium takes an immense amount of time. 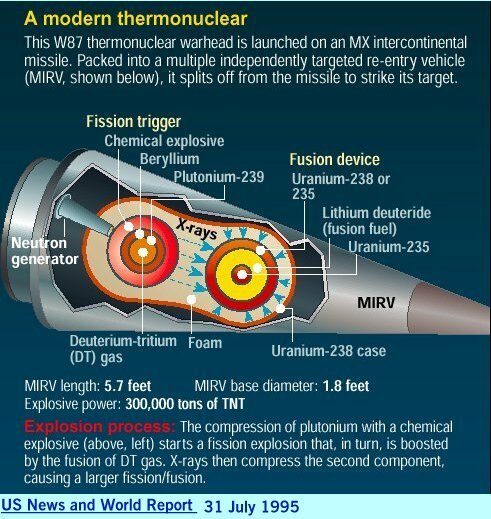 Starting from scratch, and devoting every single one of those 9,000-odd centrifuges to the enrichment process, it would still take 14 straight months to produce a single bomb’s worth (around 55 pounds) of 90 percent enriched ‘weapons-grade’ uranium. Why does the enrichment percentage matter? There are a many uses for enriched uranium, each requiring a different enrichment percentage. While nuclear power reactors require only three to five percent enrichment, medical research reactors require 20 percent, U.S. nuclear submarines need 60 percent, and nuclear weapons need 90 percent. The real worry about Iran enriching its stock of uranium lies in the decreasing amount of energy needed to reach higher levels of enrichment. Walrond compares it to compound interest. “You’re only starting off with a little increase [but] every incremental step gets shorter,” she explains. The change is exponential: The energy required to enrich a stock of 20 percent uranium all the way to 90 percent is less than a fourth of what’s required to enrich raw uranium to 5 percent. This is because as the excess uranium 238 is eliminated, the total quantity of uranium being enriched decreases and the more efficient the centrifuges become. With enough 20 percent-enriched uranium Iran could produce weapons-grade uranium in a few weeks, vastly quicker than would be detected by the quarterly reviews of their facilities by the International Atomic Energy Agency. Does getting to 90 percent mean that Iran will have nuclear weapons? Enriched uranium is only one part of the complex engineering challenge of creating a nuclear weapon. Just like having a few gallons of gasoline doesn’t mean you have a functioning car, the Iranians still need a nuclear warhead in addition to its fuel. So are the Iranians on their way to crafting such a warhead? Intent is hard to interpret, but it’s doubtful. “Though [the Iranians] continue to increase their stockpile and number of centrifuges, none of this speaks to intent,” cautions Walrond. To the Iranians, their enrichment program proves their status as a technologically advanced nation, and a world player. “While their actions are certainly concerning, it doesn’t seem that they’re in a rush to get a nuclear weapon,” says Walrond.